The latest ICAEW UK Business Confidence Monitor (BCM) shows that while business confidence remains in negative territory there is ground for modest optimism as sales and profit growth show some improvement. The Confidence Index improves but remains negative, up from -8 in Q3 to -3.4 this quarter. Overall sales growth remains steady but slow. Export sales growth is still weak though gently improving. A slowdown in input price inflation and moderation in wage growth are generating modest improvements in profits. Employment continues to grow, backed by similar modest increases in spending on staff development. Low levels of business confidence and high levels of spare capacity are holding down significant increases in investment. 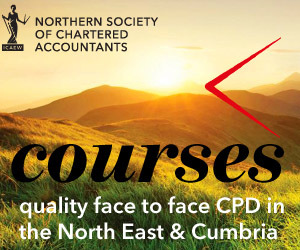 Join us on 6 December 2017 in Newcastle to hear more from Keith Proudfoot, ICAEW Director on the latest ICAEW BCM findings and an “off the record” update from the Bank of England. Our breakfast briefing will provide an overview of business confidence and the latest economic forecasts can provide valuable insights into how a rapidly changing economy is affecting business in the North East and the rest of the UK. 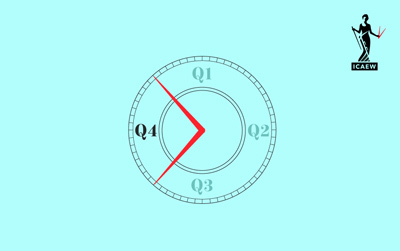 Buisness confidence – Keith Proudfoot, ICAEW Regional Director will talk about the latest findings from the quarterly ICAEW Business Confidence Monitor (BCM) will give an indication of the overall direction of the economy, what is driving change and highlights the key concerns of UK. The UK economy – Mauricio Armellini, Bank of England Agent for North East will then provide an ‘off-the-record’ update on the current economic climate based on the Bank of England’s latest forecasts. This session will examine the most recent economic data as well as the prospects for growth and inflation over the near-term. Breakfast will be available from 07:45hrs, the presentation and discussion will commence at 08:00hrs. Pre-booking is required to attend – read more details and book your place on the BCM Breakfast Briefing with Bank of England here. Michael Izza, ICAEW Chief Executive, said: “While businesses are struggling to be confident in the current environment, there are reasons to be more optimistic. Businesses are controlling costs and there is finally some improvement, though small, in export sales growth. The IT, Construction and Business Services sector are all modestly positive. Even the retail sector has seen an improvement in confidence – albeit still in negative territory. These findings highlight the cliff edge that the UK economy is on at the moment. The recent interest rate rise was not unexpected but any sudden shocks from the Chancellor at the Autumn Budget could have a serious impact. Export sales are slowly improving with growth of 3.5% and 3.9% expected in the next 12 months as the fall in sterling finally begins to reflect in more selling. Sales volume growth now stands at 4.4% compared to 3.7% the year before and input cost inflation has flattened off and is expected to fall to 1.7% in 2018. Wage growth remains steady at 1.9% as companies control costs despite planning on increasing headcount by 1.8% in the year ahead. Staff development, research and development budgets and capital investment growth have all increased moderately. Although not spectacular, the findings are more positive than previously. Among challenges to an organisation’s performance, regulatory requirements are concerning an increasing number of companies. This reflects various regulations introduced this year such as the Apprenticeship Levy, Gender Pay Reporting and forthcoming General Data Protection Regulation (GDPR). The availability of non-management skills is also becoming a greater challenge than 12 months ago (24%) compared to management skills (16%), perhaps reflecting the impact of Brexit on migration. The IT(+7.8), Energy(+4.4), Construction(+3.6) and Business Services (+1.5) sectors all had positive confidence levels. With Christmas imminent, the sentiment of the Retail sector improved from -23.4 in Q3 to -8.9 in Q4. Regionally, confidence in Wales and the South West has rallied but London remains the most pessimistic region at -7.8. The capital has been below the UK average in all but one quarter since the EU Referendum. You can read more about the key findings from Q4 2017 here. 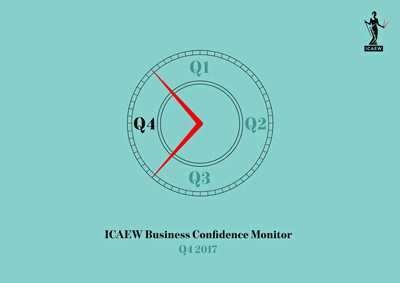 And you can download the full report here – Q4 2017 ICAEW Business Confidence Monitor report. The Business Confidence Monitor (BCM) survey began 2003. 1,000 ICAEW Chartered Accountants responded to a telephone survey from 2 August to 20 October 2017. Businesses were categorised in terms of size (no. of employees), region and industry sector. Regional classification used was ONS Government Office Regions. The BCM survey covers over 1% of economic activity both for the UK as a whole and for different UK regions. This assures our data captures accurately the mood of UK senior business professionals.